Soundflake for iPhone is a delightful app for experiencing SoundCloud on the go. The app has been built and designed by Stefan Kofler and Patrick Schneider over at 9elements. Soundflake comes with some really neat features and has a slick UI that’s been made keeping the newest iteration of iOS in mind. If you’ve been searching for a good-looking and robust app to access SoundCloud, look no further. The app follows a colour scheme similar to that of SoundCloud’s with orange and white being the primary colours. On launch, Soundflake presents you with a useful tutorial on navigating around the app. Next, You’ll need to sign in to SoundCloud and grant access to the app. Once you’re all set, the app takes you to your SoundCloud stream where you can view and hear music from the SoundCloud artists you’re following. You can switch between your SoundCloud stream and other options through the app’s main menu. This can be accessed by swiping right or by tapping on the Hamburger button on the top left. Unlike other apps where you need to make a perfect swipe starting from the edge of the screen, Soundflake uses a simple swipe-right anywhere on the screen. This is becoming increasingly popular in apps and I’ve enjoyed this style most in Jared Sinclair’s Unread and Riposte. I love the playfulness of the swipe animation in Soundflake and I also like how the status bar changes colour from black to white to suit the main menu’s blurred background. The menu automatically changes its background to a blurred version of the current song’s artwork and displays the menu choices on top of it. The main menu items include links to your SoundCloud Stream, Likes, Playlists, Search, Offline music and access to your Profile and the app’s About page. You can play a song directly through your stream or search for a song/artist/playlist on SoundCloud and play it directly from there. The Now Playing screen of the app is brilliantly done and displays the album cover in the foreground along with some basic controls such as play/pause, next, previous, volume control and the ability to Like a song on SoundCloud. The progress bar of a song that’s playing in Soundflake is a waveform similar to the ones shown on SoundCloud and provides a nice touch. The buttons on the Now Playing screen play a delightful little animation when tapped and make the app seem lively and fun to use. Tapping on the album cover flips it and lets you view details about the artist, the song, sharing and also gives you the option to download the song to your phone. I love the way Soundflake handles downloads and I must say that it worked very well in my testing. You can download a song by tapping on the aforementioned download button or by activating offline mode in the Likes menu and simply liking a song anywhere on SoundCloud. This works automagically; even when you like a song on the SoundCloud website. The app has a mini player integrated at the bottom of the screen that lets you access the Now Playing screen at anytime with a single tap. On the top right of the Now Playing screen is a button that lets you choose which song you want to hear next. This view is really handy and lets you reorganise your playlist and choose what you want to hear next. The app also gives you full access to your SoundCloud playlists and lets you create, delete or edit playlists all on the go. To add a song to a playlist, you can use the share button in the Now Playing screen or long press on any song in your stream and choose the appropriate option. If you pause a lengthy song such as one of the DJ Mixes on SoundCloud and want to start from where you left off, you can do that using Soundflake. I love the little details in Soundflake and I believe it makes for an excellent SoundCloud experience. There’s a lot to love in Soundflake but I really wish the app had some sort of dark theme simply because I love how the blurred views and the dark Up Next view looks in the app. Something else to keep in mind is that social features such as commenting and friend suggestions along with other SoundCloud features such as recording are not accessible through the app. 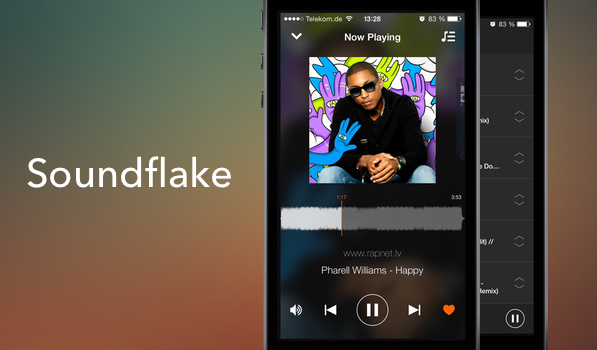 If you enjoy listening to music on SoundCloud, you will love Soundflake. The app is available for $2.99 on the App Store and is well worth it. Update (May 7th, 2014): Soundflake app has been temporarily pulled from the App Store by the developers. It will be back on sale shortly.